I bought a chrome HitchDoc (used) for my I/S. It came only with hardware for the Standard. With a bit of help from others, I created a bag drop kit that permits the hitch to be used and still pull off the bags (and the hitch) pretty much as you can with Chet's bag drop kit... a highly recommended accessory. I had previously installed Chet's bag drop kit and used a couple of nuts from it, but you can also buy everything you need to make a bag drop kit that works with the HitchDoc. More details below. DISCLAIMER: This setup has worked great for me for more than 1000 miles of towing. However, you use these ideas/plans at your own risk. I take no responsibility for anything that might happen as a result of you adapting/using these plans. About the Studs - I had to find threaded rods and cut studs to fit for my modified bag drop kit. If you are in the Houston area, you can get metric 8mm and 10mm threaded rod at Bayou City Bolt. This is very strong stuff and costs $20 for a meter length. If you cut your own studs, then the 10 mm studs are 3.75" long and the 8mm studs are 4.25 inches long. NOTE: After I spent the dough, someone suggested that I could buy bolts and cut the heads off... so... DUH... yup... that is another alternative, but long metric bolts are also tough to find. MORE SPECIFICS ON STUD LENGTH - The best way to determine the stud length is to follow this procedure. 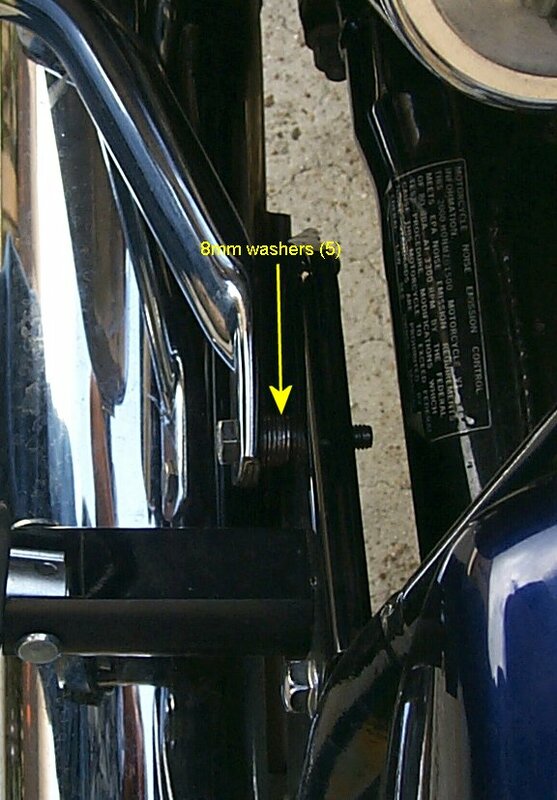 Do only one side of the bike at a time to avoid the fender dropping down... a real pain to get realigned. Remove the bolts and the bags. Screw in a piece of threaded rod. Using your fingers on the inside of the fender, screw in the threaded rod until you can feel it coming through the nut that is inside the fender. You may want to add another turn or two but there is not much point in having excess threads sticking out on the inside of the fender. Now finger tighten down the jamb nuts... see below for description (and washer for the 8 mm rod). Put on the Hitchdoc or other hitch, then the outside spacers (10 mm deep - either washers, more nuts, or the custom spacers from Hitchdoc). Put on the bag frame. (2) These are Hitch Doc spacers that came with my (used) HitchDoc to be installed on a standard. They are 10 mm deep (both the 8 and 10mm spacers inside diameter), with a 22 mm outside diameter. You could use stainless steel washers or find/make similar bushings. You could also use two jam nuts... see (3) below. (3) The HitchDoc kit for bagged bikes includes two 10 mm thick spacers. You put one spacer against the chrome frame rail, then attach the hitch, then add the second spacer, then the bag frame, and bolt the whole thing in with supplied bolts. These are stainless steel 10 mm jamb nuts... just so happens they were 5 mm each thick... so two of them together create a nice 10 mm spacer. Note that in the HitchDoc kit for bags you would get 4 of the 10 mm ID, 10 mm deep spacers noted in (2). (4) These are stainless steel 8 mm jamb nuts... with a standard 8 mm washer. Two jamb nuts plus one stock washer are just a tad under 10 mm... close enough. Note that in the HitchDoc kit for bags you would get 4 of the 8 mm ID, 10 mm deep spacers noted in (2). Miscellaneous - if you look carefully, you can see daylight between the hitch and the chrome frame rails... might could shave a mm off the spacer widths but that would be about it. One last note: You could buy the HitchDoc with all the hardware for a bagged bike. Then, instead of using the supplied bolts, you can cut studs as I did and turn the HitchDoc kit into a bag drop kit. However, I think it is important to use jam nuts (3) and (4), rather than spacers that would be supplied, to insure that the studs don't loosen. You will notice that with the longer studs getting the hitch off requires spreading each side in order to remove it. This is easy to do for two people, but quite a challenge for a single person. you pull one side loose and the other side pops back. 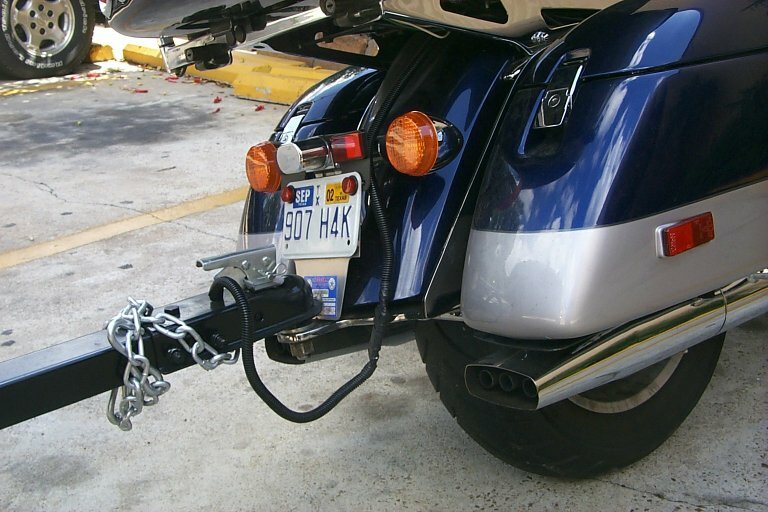 Here is a trick to making it easy to remove the hitch. Remove the outer nut bag frame and outer spacers for both the front and rear bolts. spread the hitch so that you can slip the outer nut back onto the front (10 mm) stud. Thread it down so that there is about 1/4 to 1/2 inch of stud beyond the nut. Slip the hitch back onto the stud, but notice now that the hitch is spread rather than slipping against the jam nuts. Now reamove the nuts, bag frames, and spacers from the other side. Spread the hitch to remove from studs and at the same time, spread and remove the other side with the nut on it. MUCH easier than trying to fight the hitch! (5) The 8 mm washers create a spacer 10 mm thick for the front bag frame mount (on the mufflet hanger). The HitchDoc bag kit includes 2 - 8 mm ID x 22 OD x 10 mm deep spacers to go on these bolts. I'd like to replace these washers with a spacer because they are a hassle. Final Note: The HitchDoc kit does spread your bags out in order to make room for the hitch. It can be a bit of a hassle to get the bag frame cross pipe back on. You have to push things to mate properly, but you don't need to push them too much. Essentially, the kit lets your bags hang in an inverted V rather than being completely parallel to one another.